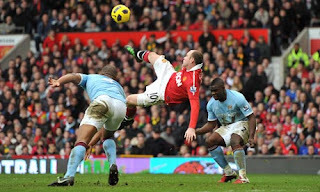 Wayne Rooney produced a banging over-head kick in the 78th minute , leading Manchester United to a 2-1 victory over Manchester City. It was Rooney's 158th derby appearance , which came out extremely pivotal for United stopping City's chances of winning the Premier League. Now United sail ahead with 57 points from 26 appearances, with Arsenal being only contender chasing the Red's with 53 points, while City only has 49 points from 27 matches. Most shocking decision by Ferguson before going into all important clash was the omission of Dimitar Berbatov, who remained on the bench, but was later substituted at 67th minute. Till then Rooney was the star forward, who took charge for the Red's . Wayne Rooney taking full responsiblity of being the senior campaigner, did not let down United at all, and produced some sensational football.Also City's mid-fielder Nigel de Jong also ruled out with an ankle injury. This was one of the turning point in the match,lessening threat for United. City , kept on dominating most of the 90 minutes of show, but United came out to produce sensation, when it was required. Manchester United opened its account with the goal in the 41st minute as Nani went on to produce a 1-0 lead for the Red Devils. The impressive Silva missed a golden opportunity to open the scoring after just four minutes when a one-two with Carlos Tevez left him one-on-one with Edwin van der Sar. Two substitution for City by Aleksandar Kolarov and James Milner with Shaun Wright-Phillips and Edin Dzeko respectively helped them in a sense the impressive Spanish winger went on to score an equaliser of City. City who sensed victory were unlucky not to score again moments later when Dzeko and Wright-Phillips but United defender Vidic went on the block brillianly Phillps. But later on Rooney went on strike a superb over head kick that flew into the top corner to secure a 2-1 lead, which remained till the 90 minutes.